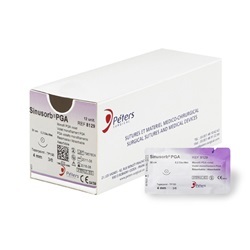 Peters brand 10-0, violet braided, polyglycolic acid sutures with single and double arms. Spatula and taper point needles ranging in length, curve, and diameter. 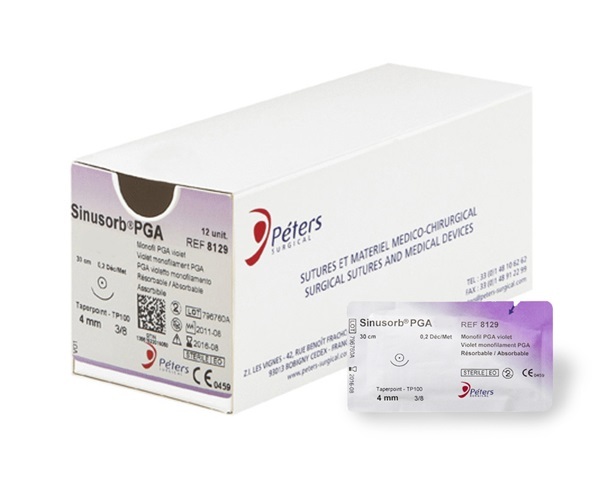 Sinus Point is the brand of sutures manufactured by Peters Surgical, with years of experience, exceptional know-how, and a 100% quality control guaranteeing an excellent product recognized by the best surgeons around the world. Sinus Point micro-needles are manufactured with the highest medical stainless steel AISI 304V. This material makes Peters sutures unbreakable. Sold 12 per box. Single-armed suture, measures 30cm in length. Taper point needle, measures 4.0mm in length, 3/8 curve, and 0.20mm in diameter. Single-armed suture, measures 15cm in length. Taper point needle, measures 5.0mm in length, 3/8 curve, and 0.20mm in diameter. Double-armed suture, measures 30cm in length. Spatula needle, measures 6.4mm in length, 3/8 curve, and 0.20mm in diameter.